Training on dyslexia for all instructors in the Yorkshire and the Humber firearms training collaboration is being delivered after the threat of an Employment Tribunal over the issue from West Yorkshire Police Federation. The training comes after a case involving a West Yorkshire Police officer – fully backed by the Federation – who suffers from dyslexia and was removed from a South Yorkshire Police run firearms training course he was attending, even though no reasonable adjustments had been made to assist him. WYPF Equality Lead Guy King says it was good to see firearms instructors were receiving the training after the case. Guy said: “The officer was going through the initial firearms course and there came a point when they said he would have to leave. Guy then accompanied the officer to a meeting with the Regional Firearms Training Lead and instructors. “They officially removed the officer from the course at the meeting,” he said. The case was settled in September before the Tribunal hearing was convened, with SYP accepting that training would be provided to instructors on dyslexia. It was also agreed that the force would formally apologise to our colleague. The officer is now on a new course specialising in Counter Terrorism firearms through West Yorkshire Police and is receiving reasonable adjustments as part of the training. Guy, a former firearms officer, hopes the result will be empowering for other officers. 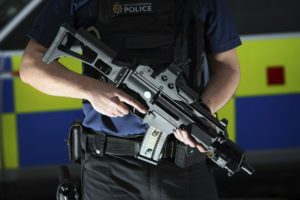 “Hopefully this will encourage other officers to come forward to be Firearms Officers because it is open to everyone,” he said.